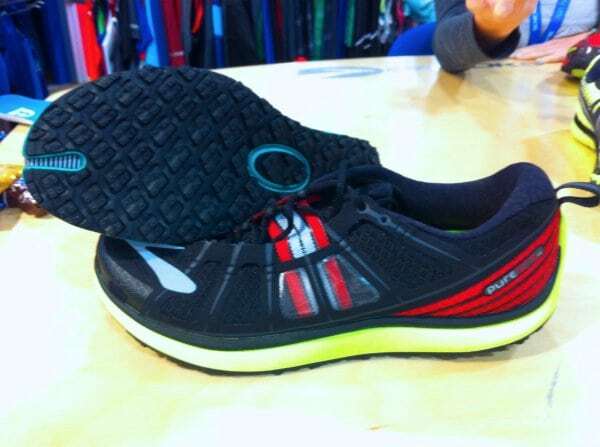 The Brooks Pure Grit 2. Just picked up my pair at lunch. Did a few minutes on the treadmill at the local shop, they feel fantastic. I would agree with D. Heim about the upgrades. Psyched about the shoe except for the colorway. I love the neon sole for foot placement, but mated with the red, maybe not so much. I adored everything about the original pure grits except the traction…my first run in them I was laughing aloud and skipping! I REALLY wanted to love this shoe, but this version just made me sad, like I lost a best friend. It is more rigid, with less trail feel and much less comfort on the road heading to the trail. There seems to be a much more prominent arch in the shoe. The bottom of the shoe seems to flare along the edges, and is softer in the center. While this provides rock protection, the spongier feel in the middle just feels weird to me and seems to cause slight rubbing on the medial aspect of my heels. My foot slops around no matter what I do with the laces, allowing my toes to collide with the front of the shoe on the downhill. It feels like a completely different shoe. Oh yea. The traction issue has been addressed. Off to stock up on the originals…. Just finished my inagural 20 miles in the pure grit 2. Feels good to me. Same under foot feel and the upper has definitely been improved with the wrap laces and such. Had just killed my pure grits and am happy with the transition. We'll see how things progress.